Jimmy Garoppolo will get his first start in a 49ers uniform (for real this time) this Sunday against the Bears, his hometown team. Garoppolo was believed to be the starter coming out of the team's bye week, but rookie C.J. Beathard had his best game of the year against the Giants and the team decided to keep him under center for another week. Beathard suffered a left knee bruise and a hip strain last week against the Seahawks, which forced Garoppolo to come in relief. Even though the game was well in hand for Seattle by the time Garoppolo came in, he led the 49ers on a scoring drive, throwing his first touchdown of the year with no time left. Since Jimmy G was traded from the Patriots to San Francisco, there have been tons of rumors as to when he would play. Some said it'd be right away, some said it wouldn't be at all. 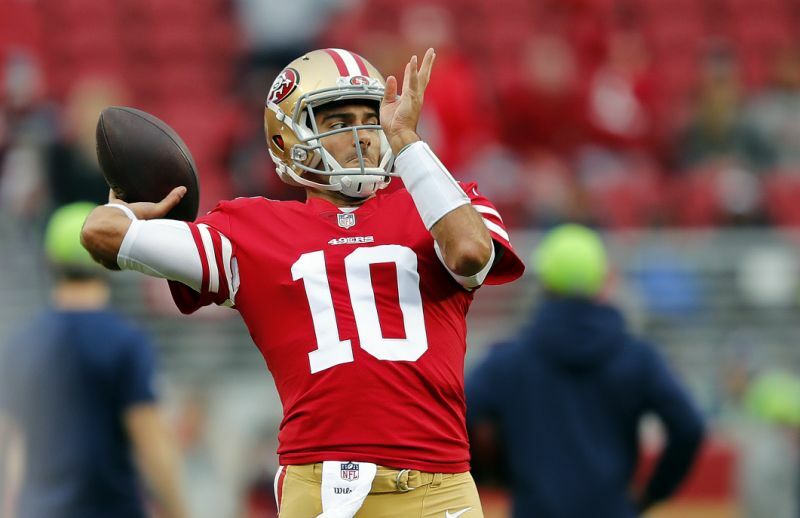 And while Garoppolo is still learning San Fran's offense, Beathard has been helping him since his arrival, according to head coach Kyle Shanahan. "He's learned a lot from watching C.J. and talking," Shanahan said. "He asks a lot of questions. Those guys are great in there. We don't hold anything back. Stuff C.J. is seeing, it's not like he waits until we're alone to talk about it. He'll say it right there and Jimmy will ask a question and vice versa. They definitely help each other. We've got a very competitive room, but we've also got a lot of confident people that when we're in there we're working our hardest to get better." In roughly a game and a half last season, Garoppolo was 42-of-59 for 496 yards and four touchdowns. Though his four-game stint as the starting quarterback was short-lived due to a shoulder injury, Garoppolo was brilliant and showed incredible poise when he was out there. This may lead one to believe that he belongs. We're certainly happy to see him finally get the shot he deserves. He was always well liked in New England and no one could blame him for wanting to get a chance to play. Another intriguing story line, while maybe a littler underrated, is that Garoppolo will play his first professional game in Chicago. He grew up in Illinois, so it'll be a homecoming of sorts. "It's going to be cool," Garoppolo said. "I've never gotten to go back there and play. When I was in New England, a couple times the Bears came out to us. That'd be cool getting back to the hometown and everything." This game probably doesn't appeal to many football fans on paper. But watching Garoppolo play is something that has me wanting to watch from beginning to end.